Ring in the new year with two newly refreshed, popular resources, both shared with a Creative Commons license: An Educator's Guide to VoiceThread and An Introduction to VoiceThread. My Educator's Guide to VoiceThread has been updated to showcase VoiceThread's wildly cool new methods of integrating existing Creative Commons imagery direct from Flickr into your own VoiceThreads or leveraging the beautiful, historically rich image resources now available through VoiceThread's direct partnership with the New York Public Library. Creating a VoiceThread does not require you to create your own media any longer -- a feeling a liberation for many educators, surely! I am hopeful that this partnership will generate strides in visual teaching and more engaging learning environments for our digital generation of learners. The "Educator's Guide" is written succinctly to get you off and running with your first VoiceThread "creation" experience, keeping issues of student privacy in mind. 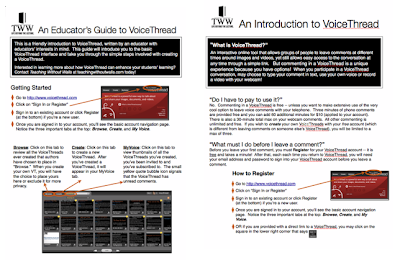 The second updated handout I am sharing is the Introduction to VoiceThread. This handout is written for a general audience which may include educators, as well as students. Essentially, the objective of this handout is to provide instructions about what a VoiceThread is and how to leave a comment. This handout may be shared with students or colleagues who are embarking upon their first "commenting" experience. It has been expanded upon and includes more enhanced features than the first version. Enjoy! Both resources may be accessed from the Resources page of the Teaching Without Walls webpage. I know there are many universities and schools who utilize these resources which I think is terrific. The original versions have been downloaded hundreds of times. I'd love to hear from some of you who have found them helpful. How have you begun using VoiceThread to inspire new ways of teaching and learning? Please share a thought with us! Cheers to a great 2010 everyone! I'll be a regular and will pass the word.